Good evening! I hope everyone has had a great week. The week was pretty mild but this weekend has been a little crazy!!! Let’s start on Friday. Because we did the Derby Mini-Marathon on Saturday (more on that later), we left my car at work because it was closer to the finish line. Not terribly close but MUCH closer than the start line. The start and finish are nowhere near each other and so we have always decided to drop a car at the start and a car at the finish. Since my car was staying at work, Mom picked me up and we headed to the folks house for waffles. I stuffed myself silly and paid for it later. My stomach felt like I had bricks in it and I was really nauseous. Needless to say, it did not help my nerves. I did a 3 mile run on Wednesday and it really caused my ankle to be sore. I was so nervous that it would not be in good shape to run the mini. My in-laws drove down to watch the race with some of their friends. 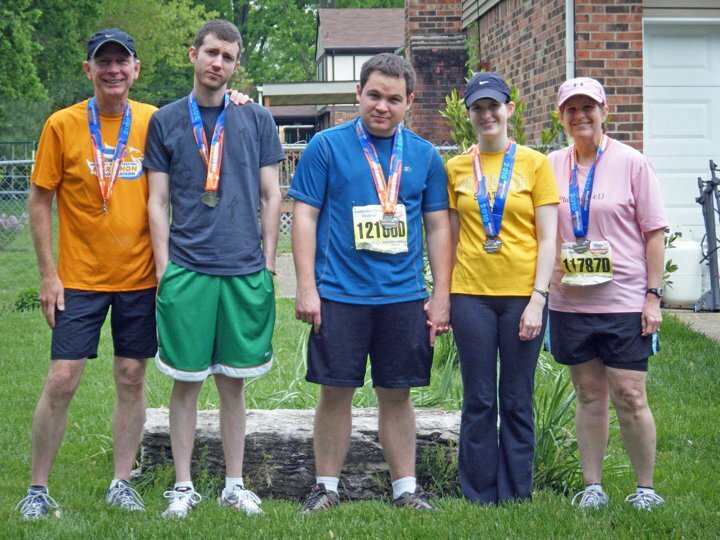 They keep in close contact with several of their college friends and some of them run the race while their spouses cheer them on. Since we had to get up early we left them and headed to my parent’s house for the night. On Saturday, the forecast for the morning called for 100% Thunderstorms. Being the paranoid person that I am I was applying Body Glide everywhere and really worrying about chafing. We headed out to our friend, Kiki’s house. She allowed us to rest, use the facilities and stash our car. We walked up to the start line just in time. My ankle and knee we hurting as we walked up. I tried to stretch as much as possible and hoped for the best. I felt good crossing the start line and all my ailments did not seem to be hurting as I thought they would be. I thought I started out pretty strong but since the course had changed from last year, I wasn’t so sure. After mile #1, we headed into Iroquois Park. I am terrible with hills. I usually walk up them and sprint down them so I was not looking forward to it. Not good for my knees and everything else but I am able to make up some of the time I lose by walking. We passed a huge banner announcing Water Stop #1 but water was no where to be found! I started to get really frustrated but finally I found the water stop 0.1-0.2 miles down the road. I’ve never been happier to see a water stop. While in the park, I saw Mom which I thought was really weird. I usually never see anyone else because I am the slowest out of my entire family. I could train really hard and never beat anyone else in my family so I was a little worried when I saw Mom. I ran up next to her and she seemed distress. She said she felt really hot and her arches and knee hurt. I was so proud of Mom for pushing through the pain. We only walked twice and not for too long. I have never run up hills like that and I am so thankful for Mom for pushing me so hard. I loved working with her to get through the park and really appreciated her being there with me. I had to walk when I first got out of the park so I encouraged Mom to head on without me. Somehow I managed to catch up with her and eventually pass her. I know that she was really discouraged with her race and I hated to leave her behind. I know she wanted me to have a really good race so I tried really hard not to feel bad about it. 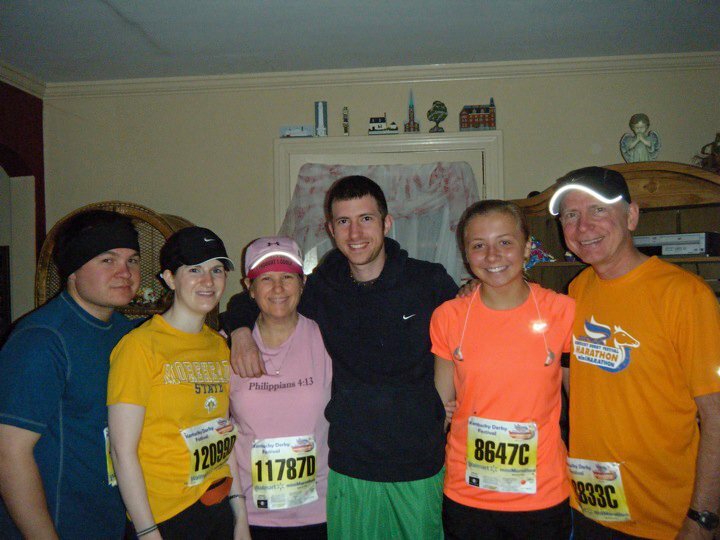 I saw the in-laws and friends at the 5 mile marker. I hit that at exactly 1 hr. Not great by most people’s standards but I was rockin’ it. I did have to walk a lot but I felt much better physically than I have felt in any other mini marathon. I can really say that I enjoyed this race more than any other. I always love running through Churchill Downs. This race is one of the Derby festivities and it is so neat to see horses being trained while you run around the in-field. This is normally where I always stop for a bathroom break but I hoped I could hold it. I wanted to make sure I didn’t waste any extra time. Around mile #10, my IT band (I think) started to really hurt. I knew where I was time wise and really hoped it would not bother me too much. It did keep me from running as much as I had hoped but I was still doing better than before. After hitting mile #12 I noticed that we linked back up with the marathoners. Sadly, it was not well marked and there were no volunteers to direct the mini-marathoners. Marathoners were tripping over people and trying to run around them. It was really a shame. If fact, one time I saw them coming and yelled “Marathoner coming through!! !” and luckily many people moved out of the way. I felt so bad for them. As we turned around the 2nd to last corner, I knew I was going to be cutting it close on my goal time. I tried to run as much as possible but found that several spectators were crossing the street in front of the runners. I almost crashed into an elderly couple and had to yell “EXCUSE ME!!! !” to try and get them out of my way. In all fairness, there was no way to get from the finish line back to cars without crossing in front of the 2 lanes of running traffic. One was strictly marathoners and one was both. There were no other options. It was so distracting to try and side step people with strollers as you are trying to finish strong. I hated that part of the race. After almost running over the elderly couple (literally) I turned the corner and gunned it. I finished the race in 2:46:27 (official time) and was both elated and a little disappointed. That is definitely my PR (personal record)! I had secretly hoped for 2:45. I could have even been 2:45:59 and been really happy. Everyone but Mom was super happy with their time. Hubs didn’t make his goal but he did take about 16 mins off his time. Dad didn’t feel well around mile #11 so he came in later than he thought he would. But overall, we were all pretty happy. I shaved 24 minutes off of last year’s time so really…I could not be happier!!! I did so good for me. I’m not fast but I did feel better this year. With the exception of my IT band, I felt well too. My friend Lauren also did really well. Remember when she came in at the same time as the hubs in the 10 miler? She came in at the same time in the mini as well but she started later so their times were each 2:40 but she came in behind him. Does that make sense? Putting mile numbers at each mile and having them be seen on both sides of the road. I had a hard time keeping track because they weren’t marked correctly. Putting water stops where they marked water stops would have been nice. Nothing is more frustrating than seeing a big sign for a water stop and then not getting water till later on down the road. There were WAY too many people. They changed the course to allow 3,000 more people and it felt really crowded the entire race. There were not enough volunteers to keep the mini and marathon separate so that the marathoners could finish strong. They had to fight to get through the mini-marathoners. While there were cones to separate the two, many did not know what that meant because no one was there to let them know. Because of how the course was laid out, spectators had to cross in front of runners to get across the street. I almost ran into an elderly couple. It was a complete distraction! And as much as I hated it…I had to do it to so I could meet up with the rest of my family. There was no way to get to cars and away from the finish line without crossing in front of runners. With that being said…I hope I get to run it again next year. I do enjoy the course and I’m always up for trying to beat a PR. However, the race issues really put a damper on what could have been a really awesome race. I have already tried to contact the organizers for some feedback but I hope they listen to the runners about all the problems changing the course created. Update: I just read on Facebook that several of these issues are being resolved for next year. And as annoyed as I was when I wrote this, I still think this is a great race and I had a really good time running it this year. I mainly just wanted to vent about some frustrating logistical problems. However, if you are looking for a beautiful race, I think the Derby Mini-Marathon could not be beat (Churchill Downs, Iroquois Park). So Wendell (Derby Race Organizer), if you read this, I mean this to be as constructive as possible. And thanks for all you do! After the race, we had to book it home to get ready for one of my best friend’s weddings. 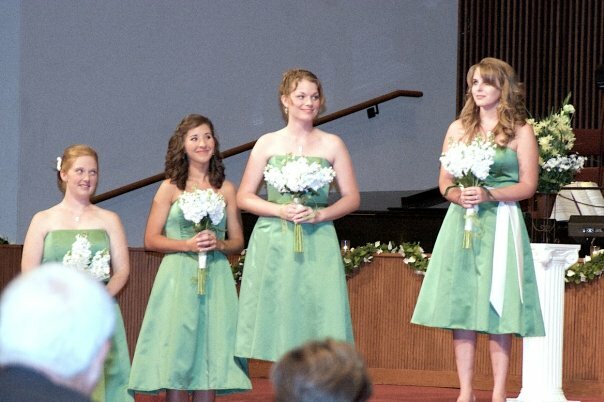 She was a bridesmaid in my wedding and I lived with her for a year at my wedding. Lauren is on the far left. (Note: she is a diff. Lauren than who ran the mini) Also, Kim, what/who are you looking at? Since this has gotten ridiculously long, I will show you pics of her wedding tomorrow!